The Living Tribunal is a humanoid cosmic entity who has existed as long as the Multiverse itself. Its function is to safeguard the Multiverse (the total sum of all alternate universes) from an imbalance of mystical forces. It may act to prevent one universe from amassing more power than any of the others, or from upsetting the cosmic balance in some way. The Tribunal may also act to prevent an overwhelming imbalance of good or evil within a universe. The Tribunal manifests itself as a being with three faces, which represent the three sides of the Tribunal's personality. Its front face, through which it usually speaks, represents Equity, the fully hooded face on its right side represents Necessity, and the partially hooded face on its left represents Vengeance. All three voices must agree in a case before the Tribunal can intervene. The Living Tribunal is the Abstract Embodiment of Multiversal Law & Order, and the collective manifestation of all existence, alongside all lesser Abstract Entities. 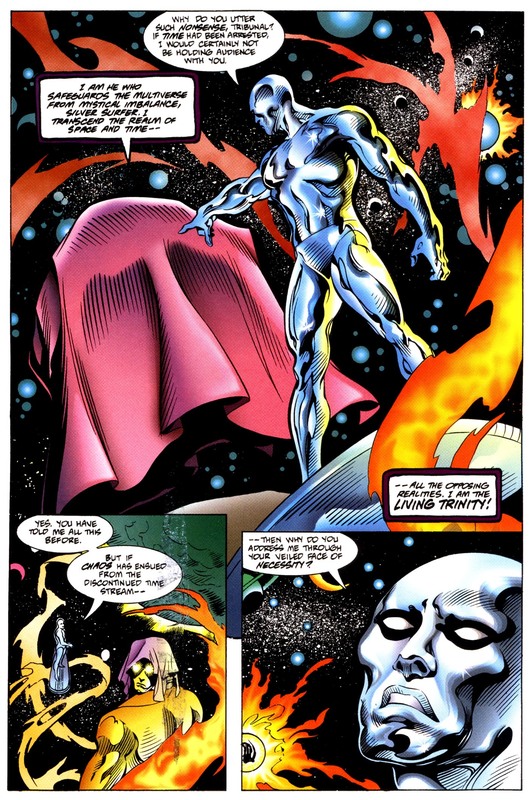 For instance, Eternity and Infinity are part of his Face of Necessity, while Death is within the Face of Vengeance, and Galactus is of the Face of Equity, while the Fourth Face he does not have is The Stranger. This principle continues on all levels of reality, such as that lesser Abstracts, with Master Order being Necessity, Lord Chaos being Vengeance, and the In-Betweener the Equity that separates both, etcetera. During the storyline Time Runs Out, more specifically within the pages of New Avengers issue #30, the entity was slain by The Beyonders alongside the majority of the Marvel Cosmic Pantheon. 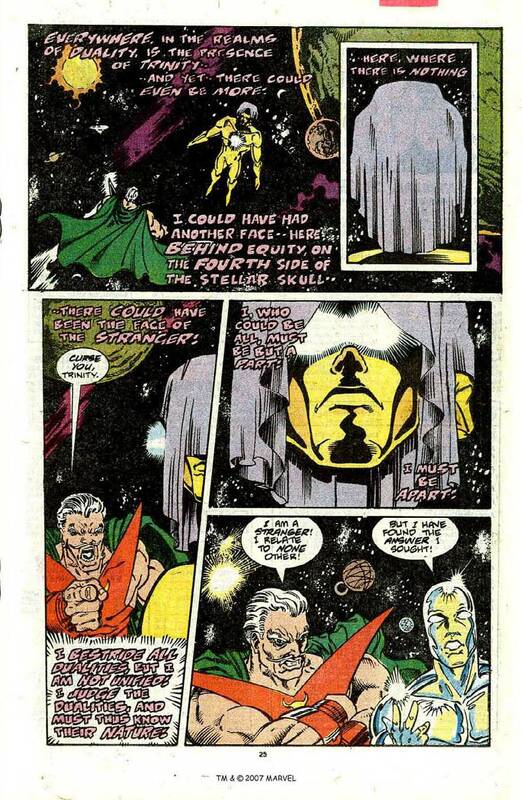 Later, during Thanos: The Infinity Finale, an alternative version of Adam Warlock replaced the entity, due to orders from The One Above All. Weaknesses: All faces must agree for action to be taken. Its Manifestation-bodies (or M-Bodies) hold comparatively very limited power. Before modifying this page, please read the Power-scaling Rules for Marvel and DC Comics. The Living Tribunal, while displayed as above the other Abstracts, being a sole entity across the whole multiverse, and capable of ending entire realities, did not demonstrate beyond-dimensional stature, nor his current level of importance until the late 1980s. As such, we cannot scale characters from the time before this to his later feats. The Living Tribunal is the combined form of all abstract entities. 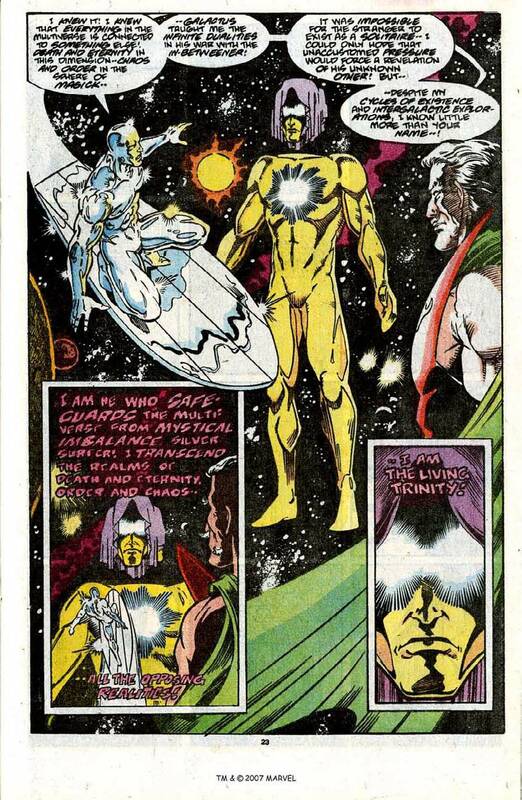 The Living Tribunal in 16th-Dimensional Superspace. The Living Tribunal holding the Brothers.